Mandas Disney Blog: Summertime at Walt Disney World Resort! For the first time ever at Manda's Disney Blog I'd like to welcome a very special Guest Blogger! Jodi from 'Magical Mouse Schoolhouse'! Jodi is such a wonderful Disney friend I've met through the Disney blogoshere and her website is a truley awesome resource for not only home-schooling, but also for brilliant Disney information and news! At 'Magical Mouse Schoolhouse' Jodi reveals educational opportunities available from Walt Disney entertainment and encourages the stretching of boudaries within the home classroom! She always ends her posts with a "Takeaway" - a learning opportunity for home-schoolers through the use of Disney movies, Disney theme parks, Disney story books, Disney art and more! (Yes! You can learn through Disney! Really! lol! ) Please be sure to check her out! It’s summertime! And at Walt Disney World Resort that means plenty of sunny weather and good times. The crowds might be packed in a little tighter at this time of year, but that just means a whole lot of people are taking in the magic, and it creates the perfect opportunity to slow down, look around and appreciate all that is The Most Magical Place on Earth. A trip to the Magic Kingdom is plussed—or kicked up a Disney notch—during the summer months with the Main Street Electrical Parade. The nightly parade originally debuted at Disneyland Park in 1972, with Magic Kingdom receiving its own version in 1977. This longest-running parade in Disney theme park history is one of the largest Disney parades, consisting of 23 floats, 80 performers and more than 600,000 LED lights. Last week, the Disney Parks Blog presented a sneak peek at Walt Disney World’s planned 4th of July patriotic and pyrotechnic displays. Check these out! I sure don’t know which I would choose if I were at the Parks today! • At 9:00p.m. 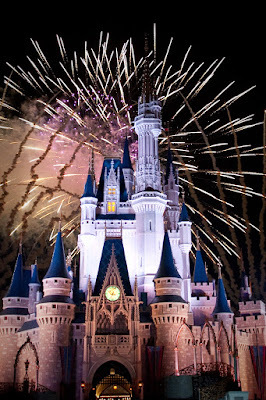 on both July 3 and July 4, Magic Kingdom will present Disney’s Celebrate America! A Fourth of July Concert in the Sky, “…paying homage to the hopes and dreams of America’s forefathers.” Take a look below! • Mulch, Sweat, and Shears performs for the all-new Rockin’ 4th of July Celebration! at Disney’s Hollywood Studios. These rockin’ landscapers take Guests on a musical road trip across America to spotlight regional inspirations and set the backdrop to fireworks, lighting and special effects. Showtime July 4 is 9:45p.m. Disney’s Fantasmic! will perform July 4 at 9 and 10:30p.m. • Throughout the day at Epcot’s American Adventure Pavilion, you can hear a Voices of Liberty 4th of July Concert and participate in meet-and-greets with Benjamin Franklin, Betsy Ross and Disney Characters in patriotic garb. The evening spectacular, IllumiNations: Reflections of Earth, will be enhanced with “The Heartbeat of Freedom,” featuring “traditional Americana themes displayed in a pyrotechnic and laser light event.” Showtime is 10 p.m.
Of course, the water parks and resort pools are especially refreshing this time of year, and so are the delightful Dole Whips. It’s a great time of year for a family adventure to the house of the Mouse! Many people in the United States will be celebrating our nation’s independence with backyard barbecues, neighborhood parties and local fireworks displays. Here’s a fun party favor I found over at hands on: as we grow. Jamie gave us her permission to share her creation. I’ve summed up the instructions here, but for full details and more photos, please be sure to click through to her blog. You’ll find lots of wonderful information there! Thanks, Jamie! 1. Place one coffee filter in the salad spinner. 2. Pour a bit of paint into a bowl and add a small amount of water to thin it out some. 3. Put a few drops of each color on the coffee filter. 4. Replace lid and spin, spin, spin! 6. Carefully cut coffee filter in spiral design. 7. Attach end to stick or dowel with tape. 8. Wave streamer in the air! Please be sure to check out Magical Mouse Schoolhouse! Reading this I wish I was at Disneyworld at the moment! It seems like there are a lot of fun things to do. I know right!? The fireworks look just amazing! I loved the post, I really wish I were there to see the Fireworks tonight..
Great post! Even with the crowds I want to celebrate at least one 4th of July at Disney.